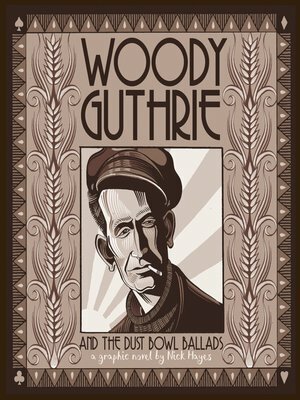 Using the sepia tones of the Dust Bowl as his pal­ette, author and artist Nick Hayes tells the story of world-famous folkie Woody Guthrie (1912–1967), starting in the 1920s when Guthrie was a teenager supporting himself in dried-up, post-boomtown Oklahoma. Picking up a harmonica and eventually a battered guitar, Guthrie finds solace in the ancient lineage of folksong. Hayes charts the musician's course from Oklahoma and Texas towns ravaged by dust and the Depression to boxcars, factory farms, and the migrant camps of California, highlighting Guthrie's dedication to singing American folk tunes and creating his own modern classics along the way. Hayes ends his portrait in 1940, at the pivotal time when Guthrie makes his way to New York and writes "This Land Is Your Land," his iconic anthem tinged with both clear-eyed reality and optimism.